Almond Board of California shows us almonds are more flexible than you might think! I'm already a big fan of almonds. No one had to convince me they are delicious and nutritious! But I did learn they are more flexible than one might think when the Almond Board of California came to town to share unique recipe ideas and showcase sweet/savoury almonds. California is responsible for 80% of the world's almond production. Oddly enough I was watching a documentary a couple weeks ago about bee colonies collapsing - it remains to be seen how this will affect almond tree pollination since they rely so heavily on bees to spread almond-y goodness! The bees actually are brought in, on a truck by a special company, to pollinate the trees. Of all tree nuts, almonds have the most protein and dietary fibre - check out this nutrient comparison chart to see nutrition information for various types of tree nuts. In 100 AD, the Romans were said to have showered newlyweds with almonds as a fertility charm. In Sweden, citizens have a tradition of hiding an almond in rice pudding as a symbol of good fortune, and the person who finds the almond is said to get married in the coming year. The almond tree made its way to the United States in the mid-1700s when Franciscan Padres traveled to California from Spain. Almond oil is a great substitute for virgin olive oil, and can provide dishes with its signature light and nutty flavour. 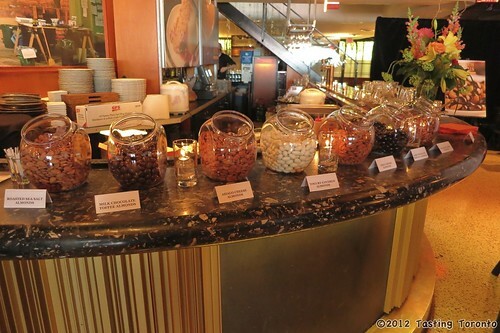 We had some great savoury almonds at the almond bar pictured above, like asiago cheese almonds (yum), as well as sweet ones like toffee- and chocolate-coated almonds and yogurt-coated almonds. My favourite foods of the night were Chef Anthony Rose's lemon-y halibut dish accompanied with quinoa, almonds and spring veggies (click here for recipe) and Pastry Chef Jenny McCoy's Almond Milk Panna Cotta with Almond Praline and preserves (click here for recipe). I'm not generally an enormous panna cotta fan but THIS ONE ROCKED! Best I've tasted for sure. Almonds are so versatile - you could encrust meat with them, you could add them into your veggie side dish (and I'm not just talking about green beans almondine) and you can even make alcoholic drinks with products like almond milk, as mixologist Michael Biancaniello of the Roosevelt Hotel in Los Angeles did with his Lost in Laos drink (click here for recipe). He also experimented with a digestif using almond oil. Make sure you guys are getting your handful of almonds per day! haha, I love your title! and very cool post, I only ate almonds as a snack before but now I'll definitely try coating my meat with it, thanks!